Last month I shared our experience of volunteering with the amazing cats of Quincy House at Best Friends Animal Sanctuary. In addition to these fabulous felines, we also spent a day with the dogs at The Fairway House and the experience, although different, was no less extraordinary. Dogtown is “a gated community” with a variety of neighborhoods: The Garden, The Clubhouse, The Fairway, and Old Friends. These canine communities allow dogs to heal from trauma, recover from injuries, learn to trust, form friendships and socialize. Each building has both indoor and outdoor space and many of the dogs (at least at The Fairway House where we were assigned) share runs with one to three other dogs. The fenced in outdoor runs are larger than many suburban yards and provide plenty of space for play and fun. All dogs at Best Friends receive expert medical care, training, socialization and everything they need to thrive and grow. Most are adopted, but some live out their lives in this beautiful canyon, surrounded by incredibly devoted and loving caretakers. Because my daughter is only ten, we were assigned to The Fairway House, which is home to friendly young adults. Besides Cassi (see below) most dogs are between one to three years old and on the larger side. Jen, our staff supervisor, explained that most of the little dogs at Best Friends have been rescued from hoarders or puppy mills and are not well socialized, especially around children. Our volunteer duties consisted of walking dogs and doing dishes. There are many walking trails of varied lengths within Dogtown. Volunteers are matched with dogs based on comfort level, experience, age, etc. Children need to be ten to volunteer and over fourteen to walk dogs on their own. Staff bring out dogs one at a time and give each volunteer instructions on what to work on (or watch out for) with each individual dog. Volunteers are also provided with a whistle for emergencies and treats for training. Dog/volunteer teams are spaced out by ten minutes to keep the dogs calm and stress free. When returning from walks, there is a bench off to the side where dogs and volunteers wait for staff to greet them and help get them settled back in their runs. Occasionally you see other dogs, but usually from a comfortable distance. Walks vary from thirty to forty-five minutes. The trails are quiet and peaceful and the outside world seems far away. The beauty of the canyon landscape combined with a heightened awareness and gratitude for a dog (who may have been hurt by others), but trusts you enough to share a walk through the dusty winding trails is kind of magical and life-changing. Our first dog was Judd, a friendly Pit-Dane mix just under a year. He was a gentle giant with deep brown eyes who won us over in about two seconds. We walked one of the longer trails and worked on down and sit with him. He was eager to learn and looked at us with such hope in his eyes that pretty much melted our hearts. It was incredibly hard to return him at the end of our walk and I can still hear him barking from his run, wondering where we were going and when would we be back. Judd is no longer on the website so I’m hoping he was adopted by a wonderful family and now off living the good life. Another one of our favorites was Lotti. This beautiful, smart, friendly four-year old girl loves running with her toys and swimming in her pool (she has one in her run). Lotti can be a bit picky with her dog friends so she will need to be an only dog or have a tolerant and patient canine companion. She currently gets weekly shots for environmental allergies and has recently switched to a fish-protein based diet. Lotti was the final dog we walked. She was friendly and engaging and did very well on a leash. Part of Best Friends’ Single Pet Adoption Special, Lotti qualifies for free adoption and a flight to her new home. Contact adoptions@bestfriends.org for more information. My daughter’s favorite dog was Cassiopeia (Cassi) a fifteen-year old, spunky terrier with a huge heart. 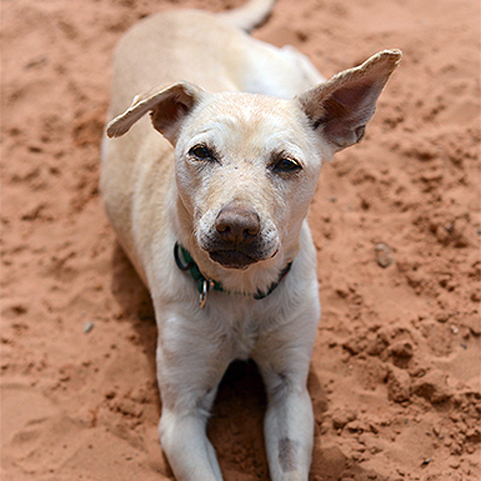 Rescued from a hoarding situation in 2014, Cassi is under-socialized and hesitant around new people. However, for those who take the time to get to know her, she is a total love. Once you earn her trust, she loves belly rubs, neck scratches, mouthing her toys, and playing tag in the yard. At her last check up, the vet found Cassi to be in perfect health for a fifteen year old dog. She currently lives with a big dog named Sherman, but like Lotti, she can be picky with her canine friends. Cassi would probably do best as an only dog with a patient human companion who would shower her with love and affection on her own terms. Cassiopeia is free to adopt, but does require a trip to the sanctuary for an in-person visit. If you are looking for a sweet, spunky senior, please email adoptions@bestfriends.org. Thanks to Jen and all the staff of The Fairway House for making us feel so welcome and for taking such wonderful care of all these beauties. In addition to the animals, meeting the sanctuary staff was truly amazing, humbling and inspiring. Many have given up lucrative careers and made great sacrifices to follow their dream and work at the sanctuary. Different ages, backgrounds, religions, and ethnicities, all united in a mission of kindness and compassion – I loved being part of it, even if only for a few days. What an incredible place. You and your daughter are angels, as are all the people who care for the dogs. It breaks my heart to hear of dogs like these who don't have their own homes, although it sounds as if they are very well loved at the Fairway House. I loved all the dogs who you highlighted. I wish I could rescue every single one. I'm sure that you felt the same way. that are such beautiful pups… I love the color of Lotti, isn't she like an artpiece? hugs to the people of Fairway house!!! Wow, that's awesome! I read a book about DogTown! It's my dream to visit and volunteer!! Great post and great place! When we volunteered at Dog Town, we spent 4 hours walking the dogs and it was wonderful. I can't wait to go back. All sweet faces! What an absolutely amazing experience! I would love to visit and volunteer at Dog Town. It's on my bucket list. Such a wonderful place!! Thanks so much for sharing it!! Looks wonderful. They are lucky dogs to be there. Such sweeties. Posts like this make me want to adopt every single dog that I see! Adorable dogs. I hope they all get adopted. What types of dogs are in the different neighborhoods? What a wonderful experience you had meeting so many sweet dogs. Wow. These dogs are amazing and what a wonderful facility! Just beautiful! What an incredible place! This seems like an incredible temporary home for them until they find furever homes. I what an amazing trip! What an animal lover you are raising! Definitely an amazing place! It is so important to teach the kids when they are young…the importance of volunteering! Great job! What an amazing Sanctuary and visit. So great that you got to volunteer with your daughter as so great to teach the joy of giving and empathy early. Beautifully written as always. I'm so glad you and your daughter were able to go there and help. Judd touched my heart and I hope he got a wonderful home somewhere. I have helped Best Friends with donations almost since their beginning and it's wonderful to see how they have grown and that so many have responded to the need of the cats and dogs there. A place of love in this world of ours. I love hearing about organizations like this. What an amazing place. Thank you for sharing! This makes Mommy want to visit even more. She'll probably come home with a new family member when she does! A special post with so much love. Well done and those dogs really get to you don't they! I am glad that you had such a great time at Best Friends. I told my companions that it was like Disney World for animal lovers. I know that Lotti and Cassi must have loved spending time with you and your daughter. I hope they find homes of their own soon, but I know that they are safe and happy at Best Friends. I wonder if I would be a blubbering mess if I visited there. Your journey and sharing it with us is spectacular. Did you feel liberated or sad or both? What a great experience. I never thought about the undersocialization of dogs from back yard breeders or hoarding situations. I love these photos! What a lovely experience that you got to share with your daughter. I'm sure my daughter would've loved it as well. Best Friends has become such an awesome voice for animals. Thanks for sharing your experience there and giving us a little look behind the scenes.